Just thought I'd pipe up about "representing" at my local Franklin County, Massachusetts interfaith memorial. There was a very impromptu service at the monthly Interfaith Council of Franklin County meeting on Thursday, April 18. Interfaith banners and prayer flags were draped on the table in the meeting room and candles were lit for the (then) three victims and one for humanity. Clergy attending offered two or three readings along with a couple of personal observations on tragedy and how to cope with it. I had nothing prepared but I was moved to recite the lyrics from "Old Woman, Weave and Mend..." (I couldn't sing it or I would start sobbing). There was a very thoughtful silence after my reading. After the meeting, I was approached in the parking lot by someone from the group who thought she might know the song (she’s a local “walking song book”!). She did; and so, joined by her and my other interfaith Pagan colleague, MaryColleen MacDougal, we circled in the parking lot, three women, and sang it into the night….watched by the soft white statue of the Virgin Mary in her rose garden, lovingly planted and tended by the priest of the hosting church, Our Lady of Peace. I'm glad that Jennifer was moved to participate in this way and showed care and compassion in doing so. Perhaps others have had, or will have, similar experiences. Don Frew, who is a member of the ICP Board, and I were among the planners. We were the only Pagan presence and the only non-Abrahamic presence among the planners. In attempt to more accurately reflect the religious diversity of this region, I contacted my interfaith colleagues in the Hindu American Foundation and located Srivats Iyer. Srivats offered a prayer before lunch. Although Srivats is neither chaplain nor service member, as a pilot he has regularly flown supplies into Iraq. Another year has passed and one of last year's sponsors produced another event, this time co-sponsored by the Interfaith Center of Contra Costa County. Previously I had expressed my interest in participating in similar events in the future, and, although I was not among the planners of this latest effort, called Embracing Our Veterans: Helping Congregations and Spiritual Communities Respond to Their Needs,3 my contribution of the previous year led the organizers to ask me to expand the talk into a one-hour workshop. The organizers had assembled an impressive array of speakers and resources. I arrived after the keynote address; however, I picked up several very useful handouts and spoke with her later. Keynote speaker the Rev. Charlotte Bear is Regional Trainer and Educator for VITAS Innovative Hospice Care, interfaith chaplain with the United Methodist Church and the Universal Interreligious Order, U.S. Army veteran of the Panama-Grenada-Lebanon conflicts, and recipient of an Army Commendation Medal and a Meritorious Award for serving as the first woman TV news director in combat theaters. Her handouts included information about: (1) ministry barriers; (2) a comprehensive list of the military community; (3) outline of the process by which war is declared; (4) the service member's "Oath of Enlistment"; (5) "uniformed" military branches and their areas of responsibility; (6) service ranks/rates/grades; (7) who is a veteran? ; (8) combat periods at a glance; (9) the veterans' community; veteran populations (from different wars, women, disabled, etc. ); (10) California veteran populations by county; (11) VA4 system at a glance; different military generational experiences; (12) current military work and configuration (missions, gays, women in combat, periods of service, etc. ); (13) polarizing projections; (14) understanding issues service family members face; (15) major service-connected medical issues; (16) psycho-social-spiritual conditions across all combat eras; (17) military family stressors; (18) military family support; (19) conversation starters; and (20) ministry ideas in the mission field. You can see what an amazing series of resources this is. Various agencies had information tables, too, from which I took "Ten Things You Should Know to Help Bring the OIF/OEF Veteran All the Way Home," "10 Things Your Combat Vet Wants You to Know," and an extensive bibliography. There were two guided conversations during the day, "Building Bridges Between Military and Civilian Cultures" and "Entering into Spiritual Conversation with Veterans." Panelists were pastors, chaplains, rabbis, and military personnel -- again, all Abrahamic. Two other workshops took place at the same time as mine. I was most interested in "Recognizing PTSD and Moral Injuries" and thankfully presenter the Rev. Penny Phillips gave me a copy of her notes. In seeking resources within the Pagan world for my workshop, I received material from four individuals. Erynn Rowan Laurie, herself a veteran, provided me with two Celtic reconstruction rituals, one, "Warrior Consecration Ritual," for sending a soldier into combat and another, "Warrior's Return Ritual," for welcoming him home. Graeco-Egyptian reconstructionist Tony Mierzwicki shared material from his presentation "Pagan Warriors Past and Present" at the Claremont Pagan Studies Conference this past January. A phone conversation with Selena Fox inspired the first piece I wrote on Ritualizing Returning Home. And finally, David L. Oringderff, retired from a 27-year career in the military, sent me the Ritual Altar Book of Sacred Well Congregation. Photos illustrating my Power Point are from a warrior blessing ritual created veteran David Sassman of Pagan Educational Network and performed at CoG's MerryMeet in Indiana in 2010. Tony's work provided me with statistics about Pagans in today's military and the general composition of military chaplaincies. For instance, DoD data reveals that of the 2,500 military chaplains currently serving "the nation's corps of chaplains leans heavily toward evangelical Christianity, failing to mirror the military it serves." And "Even though just 3% of the military's enlisted personnel and officers call themselves Southern Baptist, Pentecostal or some form of evangelical, 33% of military chaplains [who are supposed to serve all religions] are members of one of those groups," according to the Pentagon. Air Force data reveal that "87% of those seeking to become chaplains are enrolled in evangelical divinity schools." Estimates of the number of Pagan military personnel and dependents vary from 10,000 to 100,000 (from the Military Pagan Network (1992-2010), Circle Sanctuary and retired U.S> Army Major Michelle Boshears). Although these data don't directly concern veterans and ritual, knowing them fortified my resolve to continue addressing the needs of Pagans in the military in whatever small ways I can. When we are confronted with the uniqueness of veterans' experiences, and challenged to help them in their changed states to reintegrate into their families and communities, I wonder what we can offer in the face of these challenges. I have chosen ritual. Ritual is something for which I have an enduring interest. Within the Pagan world our rituals are not hidebound and unchangeable. We often create new rituals and recreate older ones. So ritual theory, design, techniques, and suggestions are things we can bring to the common table in the world of interfaith. I'm grateful for the opportunity to contribute something, anything, to this effort, and I hope other opportunities present themselves in the future. 1. I suspect I was distracted by the mind-blowing experience of having my grandson appear out of nowhere exactly one year ago today. 2. This piece was also published last year on this blog and on the CoG Interfaith blog. 3. I much prefer the former title, "Beyond Memorial Day: Understanding the Hidden Wounds of War." 4. In doing genealogical research, I have learned that before the Civil War there was no formal governmental aid for veterans. The U.S. Sanitary Commission was established to meet that need. The commission was set up by each state, and one of my forebears, Dr. Harold Havelock Kynett, was one of the people who set up the U.S. Sanitary Commission in the State of Iowa in 1861. 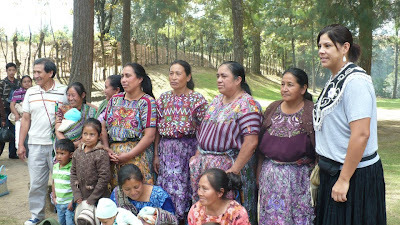 In this post I will discuss the rituals That took place in Guatemala last December in depth. 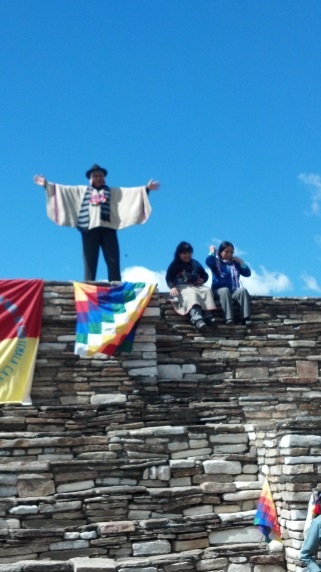 Below is the first sacred site that we visited and in which we held ritual. 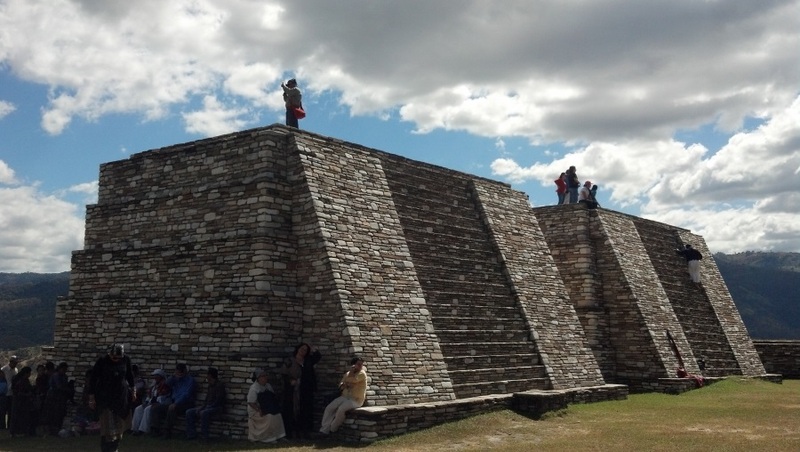 These Mayan ruins had been well maintained but not rebuilt. We marched in in procession supposedly in two lines (you can see how well that worked for us) which quickly deteriorated into an amicable group as we walked toward the ritual site. This is a public park and so throughout the day the tourists were wandering through and taking pictures. I am certain that they were somewhat confused as to what was going on, entertainment for them or something serious that they should avoid. We basically ignored them as invisible. As we had been thoroughly smudged earlier in the day we received only a cursory smudging once at the site and everyone formed a rough circle. Set up took some time and so we all sat and waited patiently. The day was sunny but there were enough clouds to keep the temperature pleasant. The first necessity of Mayan ritual is that all heads must be covered, men and women alike. No one said anything to any of the guests but Tata Apolinario scolded several younger Mayan folks who immediately covered their heads in ritual scarfs. I followed suit by wrapping my head in the stole that I carried. All women wore skirts. I also wore a skirt with jeans under it so that I could get the skirt up high enough to climb, sit and otherwise be somewhat mobile without being disrespectful. It didn’t seem particularly necessary today but in my pockets were my wallet and other necessary things that I did not want to leave lying around in a purse. The men, for the most part wore white shirts and often white pants as well. 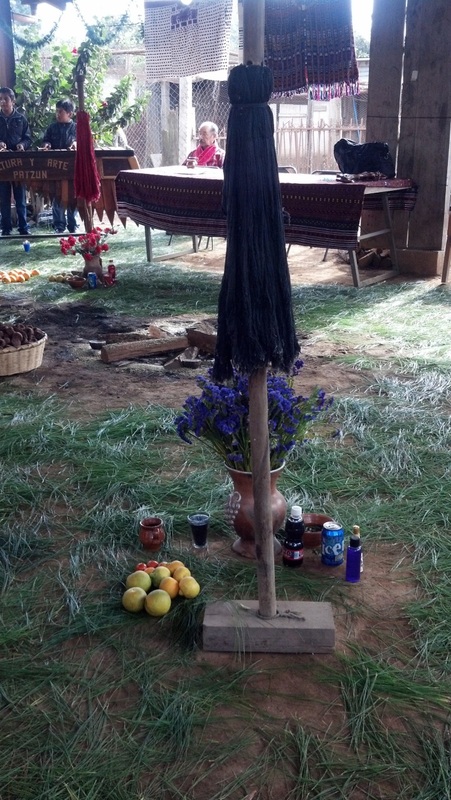 The ritual set up is not as stylized as a Wiccan circle but no less cluttered and complex. 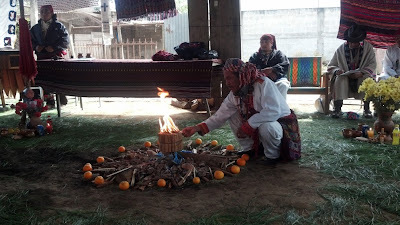 First the baskets of Copal balls, candles, and other resins necessary for offering to the fire and then the musical instruments and Sacred drink. Here Tata (far left) watches over the proceedings with a very careful eye. He will don his head scarf shortly as well. Things actually remained this jumbled for the duration of the ritual which lasted from about twelve in the afternoon to four thirty. The ritual started with all of us forming a circle. We all got down on our knees, backs straight and each of us in turn was offered Atoli, a sort of corn mush drink made of four different types of corn. It was warm and sort of gritty but bland and easy on the stomach. It was very ceremoniously served from a tiny earthenware cup which was then wiped clean and refilled for the next person. I was rather grateful to be very near the starting point. Once the cup was shared with everyone including the musicians, the quarters were called. First the East, then West, then North and finally South. Altars were set up at each of these places and there will be pictures of them later in the report. All of this was done on our knees, schooching around to align ourselves properly at each calling; a real trick in a skirt and I was glad that I had pants on underneath as it allowed me to get the skirt out from under me and rest on my jeans. Then followed the calling of the Mother Earth, Father Sky, Grandmother Moon, and Grandfather fire and finally, the honoring of each group of people there by formal announcement of the name of their group, their location, and the name of their representative present. As you can guess the list was long but the Wicca were clearly a part of the calling with me as your representative. Once every group was named, we were allowed to rise and the Gods and ancestors were called upon to witness the rite. My back was in serious trouble by that time and continued to stiffen throughout the day. We were told to offer the copal and candles for the health of our organizations and then Tata called for music. Now after holding that resin in my hands in the warm sun for about an hour it had clung to my hands like glue and I had a heck of a time getting it off. After that it was more of a picnic feeling with people walking around visiting, looking over the ruins and generally having a good time. Dancers performed ritual dances explaining in art some of the Mayan myths. At this point most broke out the sack lunches given to us earlier in the day and munched. Below is a picture of a few of our gathering. You might recognize Alejandrino at the left of the group and the young woman at the far right, Cherylann Brant, is from the Mohawk people, and yes she is that much taller than anyone else there and about the same height as me. This is not a trick of camera perspective. At around 4:00 PM we were called back together into a circle again, once again on our knees to give thanks the the Gods in attendance, the quarters for their participation, and those who had come to join us in our rites. Our next ritual was held the next day at the “Steak House” and was held in three parts, all much more structured than the previous day. As we were eating breakfast men were busy sprinkling the ground around and under us with masses of green pine needles to a respectable depth of about ½ to 1 inch and the four quarters were set up as well as the fire. Let me speak here of the fire. The Grandfather fire is always set in the same manner. First a circle is proscribed and defined by fire rocks. Often interspersed with these rocks or in place of them the circle is marked with fruit, in this case oranges. It is then laid out by first dividing it in half with wood or pine boughs or some other clear delineator. Thus are the realms of Heavens and Earth made clear. Then the circle is divided in the other direction into Day and Night. Into each of these quadrants is placed a great deal of sacrificial material, chocolate, cigars, copal, more copal, seeds, resins, candles and whatever else one feels is correct to offer. The Maya have up to 20 Gods and/or Goddesses depending upon the group with which you are practicing. By the time all of this is laid in the fire has been built up to anywhere from six inches to a foot. Below, this particular fire had a stand on top of the “teepee” of wood which held a bundle of cigars and candles. The fire is always respectfully maintained in that shape because a very bright ancestor very early on discovered that if you do so the smoke inevitably rises straight up, the heat being focused in the center of the pyramid. It also causes an interesting phenomenon which makes the smoke spiral upward often in two helix type figures. They say that this is an indication that the Gods are listening. It might well be so as the only time that I saw it was after I had asked a question or blessing of the fire. There is a further space that is maintained around the fire of about a two foot radius outside of the fire stones into which no one must step. A small broom or hearth broom is kept by the fire at all times in order to continually sweet the area around the fire and maintain the space. Each Quarter is delineated by a specific color. Yellow for East, Red for South, White for ­­­­­­­­­­­­­­­­West, and Black (blue) for North. Each quarter is very elaborate beginning with a pole in the ground which contains a tassel made of strips of cloth of the correct color. Then flowers of the correct color are placed in a tall vase on the ground or on a small alter. Around that are candles, jars holding foods of the appropriate associations and colors, and bottles of scented liquids that I believe are primarily water. Notice in the picture below that there is even a blue can of soda. The quarter is basically a small representation of everything that one needs in life; food, drink, and beauty. The circle began with the calling of the quarters, no atoli this time. Once again the quarters are called in diagonals. The East is called upon first, then the West, then North and finally South. At this time, as there were chairs available, Tata Apolinario told me to sit and stay seated during the opening ceremonies. However all of the younger folks were once again on their knees for the calling of the quarters and the Gods and ancestors. Once again all of the participating groups and their representatives were named and then everyone was seated as we received a forty-five minute talk on how the Mayan calendar actually works and why this was the ending of an Epoch. He then went on to explain how the people have forgotten how to make proper ritual, burning copal, candles, and many other things like the sacred wood without understanding why or the proper methods. After this the North American Mohawk Wolf Clan took over the ritual. There were several Wampum Belts, some very old and some new and the purpose and meaning of each was explained to us. Then the clan mother asked that the people divide themselves into the people of the North and the people of the South. Those of us from the North came to join the clan mother and those from the south went to the other side of the circle to join Tata. For this part of the ritual we became two tribes. On each side of the circle there was a rack made by pounding two sticks about two feet tall into the ground about two feet apart. Each stick had a y at the top and another branch was placed across the two. On this rack on the Northern People’s side lay several strings of beads. The clan mother then asked that a person be chosen from the people of the south to be a runner to stand behind the southern rack. At this point the ritual began formally. Hana, a young man of the Wolf Clan approached the fire and bending over it yelled three times to get the fire spirit’s attention. He then chanted our purpose in his own language. Once he had completed that calling, the clan mother took up one of the strings of beads and held it up. (Please understand that I paraphrase here.) Now she handed the beads to her runner previously appointed who carried it to the south’s runner who in turn placed it over the rack. This went on until all of the strings had been transferred talking of plucking a feather from the tail of an eagle to fan the heat from their visitors, and the down from a duck to provide a soft place to sit. I was, I must admit so taken up in the ritual that I do not clearly remember all that she said. Once she had properly greeted her guests it was our turn to await a reply. Tata Apolonario, as oldest among the people of the South, gave reply. Picking up each string of beads in turn he replied in kind. This in my opinion was a masterful feat as he had to remember what each string of beads was for and then make a lucid response off the top of his head has he later confessed that he had not be warned and thus had no time to prepare. After that the runner chosen by the people of the South returned the string to us across the fire. The welcome and response completed, the two groups formally acknowledged each other and some talk ensued as to developing the bonds of friendship. Having reached agreement on some specific points of kinship and support, we all fell into a full circle once again and Tata called all of the youth of 18 and under to come forward. He and some designated helpers collected all of the bottles of scented liquids and he sprinkled all of the youthful participants with particular attention to wiping their upturned hands. He then picked all of the petals off of the flowers around the quarters and gave a handful to each of the young people who then gathered around the fire. At this point the fire had burned out pretty much, leaving coals which were swept close together into the middle of the fire circle. The participants circled the fire and offered up the petals to it. Then everyone was given a sprinkling and a handful of petals and lined up to bury what was left of the fire in a colorful pile of flowers. After each person made the offering they proceeded around the circle greeting the participants and each person who had preceded them in turn. Once everyone had completed that task Tata called the ritual complete. To the left, Yoland and a young helper sort the pounds and pounds of ritual supplies that were hauled around with us specifically for these rituals. 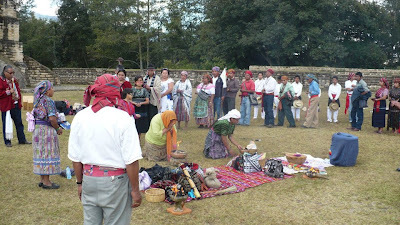 The Mayan rituals are very expensive to produce in large part due to the costs of these materials. Grandma Char actually came down from Canada early to help collect and bless these materials for the upcoming rituals planned. The next large ritual was similar to the first that I have described here with the exception of the working which was aimed at giving energy where it was needed for whatever purpose an individual believed to be necessary. This day we were surrounded by rebuilt grounds that covered an entire valley, an amazing accomplishment of reconstruction, though many ruins could still be found in and around the area. We found ourselves in another plaza surrounded by high towers to the East and West. To the left we are entering the Plaza after a bit of a walk from the East. We were told that on the Solstice the Sun would rise directly between the two towers. During this ritual there was much more picture taking, which did not sit well with most of the folks from North America but did not seem to bother anyone from Tata’s group at all. People would actually step into the circle while callings were happening which some of us felt was pretty disruptive. This ritual too was four hours long and for the most part had a very picnic like atmosphere. 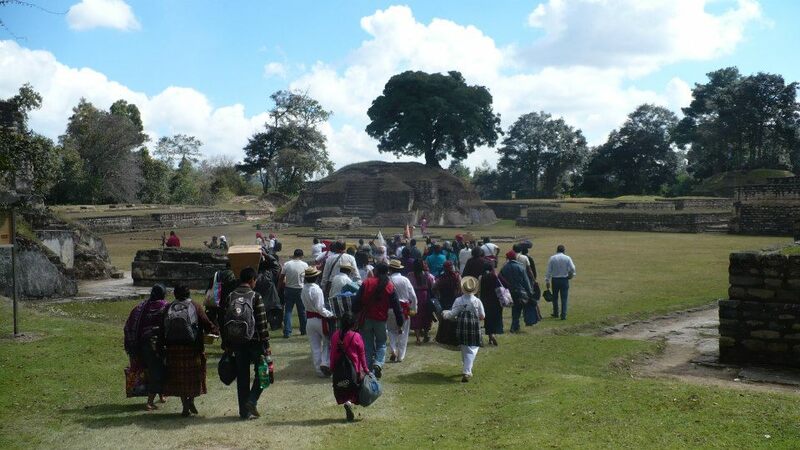 People would come together for the ritual parts and then drift off to see the ruins. The fire at this ritual was not nearly as elaborate though it contained all of the elements mentioned at the previous day’s celebrations. Here at the left, Calixto and two friends climbed the West tower to post their flags in Pride. 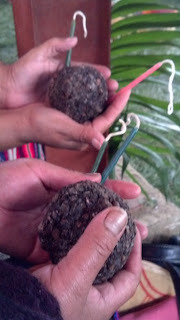 To the right is a picture of the balls of copal and candles that we were given to offer to every fire built. These were often accompanied by loose concoctions of resin, pitch, and seeds. The mass that they gave us during this ritual was particularly sticky and I did not get it off of my hands completely until the next day. Thereafter I learned to offer a piece of cloth in which to contain this mass; the entire combination including cloth to be offered up to the Grandfather fire. The thirty-six hour ritual was opened the next morning with the lighting of the Grandfather fire This ritual once again followed the basic script with a few differences. For the next thirty-six hours the fire would be tended by a specialist who volunteered to tend it for an hour’s time. This person was trained by Tata in the proper manner and respect of this tending. A drum beat that was a heartbeat rate also started and ended with the ritual, again with volunteers changing each hour. In this case the drum beat was never interfered with during the change of personnel one keeping it going while the other settled in to begin the work. Each morning and each evening the quarters were open and dismissed. Tata would call upon someone to assume each quarter and fulfill this task without warning or instruction. He called primarily upon the older folks. I was called upon both to open and close the day at different periods. After the dismissal of the quarters the young folks generally gathered around the fire to sing, dance and tell jokes, much like the California indigenous people, while the older folks retired for the evening. The intent of this circle seemed to be more that of holding sacred space for the work that we were doing rather than for any specific working. We held three days of business meetings within the circle and two more rituals were conducted during our three days, one outside in another location and one inside the circle. The first took place the day after we had arrived. We walked to a small sacred spot up the hill that had been used for ceremony previously. Each person entered this circle one at a time, the men being smugged by the women and visa-versa. While the quarters were again called, we did not get down on our Knees but simply turned with the callings, still on the diagonal. We skipped the litany of who’s who and got straight to the point of the ritual which was healing for three specific people, among them Don Frew, and any others who needed it. There were not nearly so many people at this ritual ( I would say no more than thirty) which helped to focus the energy and maintain a sacred view point as well. As soon as the quarters were set young Hana of the Wolf Clan people strode to the center of the circle and cried out in his own tongue. He was answered from outside the circle in a response from another male. It was a call to ritual and a ritual recognition thereof and made the hair all over my body stand straight up. He then shouted three times at the fire to attend and stated the purpose of the ritual. He grabbed that power and sealed it in as tight as any man of power I have ever had the honor to witness. This was a full on ritual; No picnic, no sight-seeing, no fooling around. The pictures of the three needing healing were presented to the fire and people stepped up to offer prayers, songs and poems. The usual offerings and others were made to the fire, the intent was stated and the circle was opened by the simple expedient of Tata saying that we could all head back to the house. The entire process took about three quarters of an hour or so it seems. I did not keep linear time during that trip so you must accept my estimates and you know how ritual time is, especially where there is real power moving within the circle. It must have worked because Don says he felt good as new during the three days we held space. 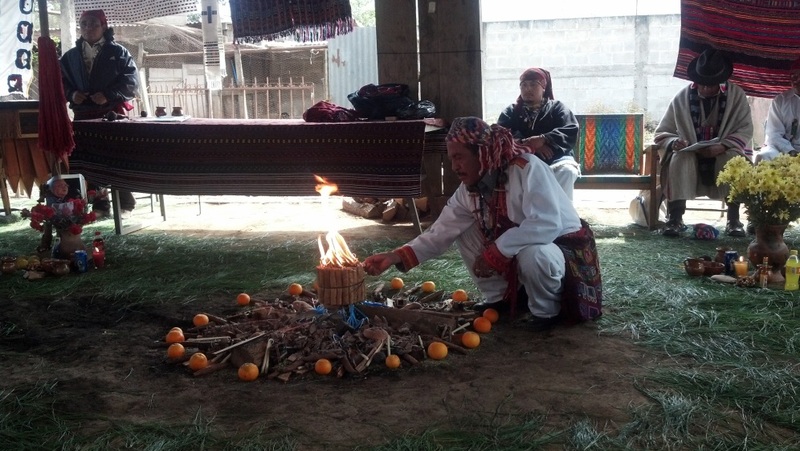 The last ritual was done by Calixto, a Bolivian Shaman. Don calls this the “Magical Pizza” ritual. It too must be very pricey to produce as the amount of “stuff” is immense. The first thing that he laid down was a round circle of llama wool on top of a large white piece of paper which he set on top of a ritual cloth. Then he placed a hard sugar mold of a cone, or tower in the middle (ergo the image of a magical pizza.). This he said, would act as a focus for all of the energy and power raised. 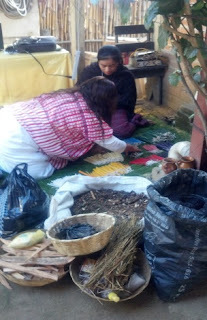 Serving as a helper and balance to his male energy, I handed out llama wool dyed in rainbow colors. Next I began to un-wrap hard sugar molds of various types. One, for instance was a snake. There must have been about twenty of these, each about four inches square and each representing some sort of special energy. Each of these he explained and then assigned to a person around the circle to hold and represent that energy and carry it to the “pizza” at the assigned time. Once all of those pieces were handed out he told those handling them to place them in the circle of llama wool. Next he explained that the dyed llama wool represented the mix of people that had come together and told everyone to place that in the pizza. I was tasked with keeping everything tidy and contained within the circle on my side. Finally he and I handed out some small hard sugar molds of various shapes and figures. These, he explained would serve to carry the individual’s own prayers and desires. At last the Pizza was well prepared and ready to be carried to the fire. He chose a man and woman and the four of us carried the paper with the pizza to the fire and placed in the fire to be consumed. You might well imagine that smoke! Ritual complete. By the way, Calixto has given me permission to reproduce this ritual here for you. If I can ever get everything together for it, or reasonable substitutions for our head space and location, I will do so. I will say that normally when Calixto does a ritual you will immediately recognize it as originating from the same source as our own. Everything done in the same way that we do, though he insists that he was taught by his father who was taught by his father who…and so on. The only thing that I have not seen anyone do is eat and drink to ground themselves after ritual. 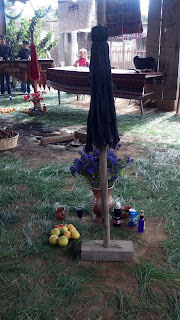 In fact the only thing that we consumed during ritual while I was there was the Atoli for recognition of the elements at the beginning of the first ritual. As you may now be able to tell there are some fundamental differences to our approach to ritual in the South and North. As this article has grown so long and ponderous I will leave it to you to ferret them out but truth to tell even though the rituals had a more European approach in South America despite differences in emphasis, I found myself far more drawn to the North American practices during the few times that they stepped forward; felt closer to them, perhaps because they spoke in more poetic, ritualistic ways; or perhaps because they recognized so much more clearly the delineation between sacred and mundane space. I cannot say. I have reported as closely as possible what I witnessed and experienced. Now I leave it to you to draw your own conclusions.